Do you or a loved one take blood pressure medication? If so, you should be aware of the latest FDA Recall Announcements for certain blood pressure drugs that contain valsartan, irbesartan and losartan. These popular blood pressure prescriptions are all part of a class of drugs called angiotensin II receptor blockers (ARBs). Multiple manufacturers and distributers are recalling certain lots of their ARB blood pressure products over concerns of contamination by N-Nitrosodiethylamine (NDEA) or N-Nitrosodimethylamine (NDMA). NDEA and NDMA are chemicals known to cause cancer in certain animals and are classified as a probable human carcinogen. Because of the probable connection to cancer in humans, there are pre-determined levels of acceptable exposure. Multiple lots of valsartan, irbesartan and losartan products have tested above these acceptable levels. The FDA is continuing to monitor the situation, and additional recalls continue to be announced. The FDA is also working with the manufacturers to ensure proper steps to identify contamination are taken by the manufacturers, as the FDA states that “[t]he agency reminds manufacturers they are responsible for developing and using suitable methods to detect impurities, including when they make changes to their manufacturing processes.” The FDA had developed, and published about, gas chromatography/mass spectrometry (GC/MS) tests that will detect NDEA and NDMA impurity levels. 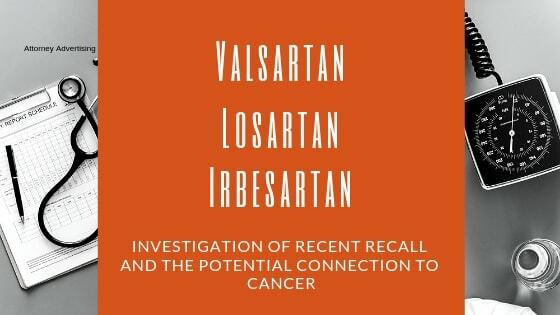 It is important to note that not all blood pressure medicines containing valsartan, irbesartan or losartan have been recalled or are suspected to be contaminated. The FDA recommends continuing to take prescribed ARBs until you contact your healthcare provider or pharmacist to determine whether your medicine is subject to a recall. If you or a loved one has taken a blood pressure medication containing valsartan, irbesartan or losartan and developed one of the cancers listed above, reach out to our office for additional information. The experienced pharmaceutical and drug lawyers at Zoll & Kranz are actively investigating personal injury cases related to these recalls and may be able to help. We have extensive legal experience surrounding contaminated drugs and fighting on behalf of plaintiffs. Read more here. We will be posting additional information as the situation progresses. The best way to learn more about a potential product liability claim is to reach out to our law office directly. We have a live chat service on this website or you can call toll-free at 888-841-9623. So if you believe you or a loved one have been injured by the pharmaceutical drug valsartan, irbesartan or losartan, contact us today for a free consultation about a potential claim. You can also fill out the form below and we will reach out to you for a free case evaluation.